I saw a lot of bad plays in 2017, but two of the most egregious offenders were John Patrick Shanley’s The Portuguese Kid for Manhattan Theatre Club and Beau Willimon’s The Parisian Woman on Broadway. Beyond performance-related issues (the former committed the mortal sin of wasting Mary Testa, and I’m pretty sure Marton Csokas was drunk the night I saw the latter, which at least guaranteed one interesting performance on that stage), they both shoehorned in exploitative and pandering Trump references. This bid for topicality is understandable as a marketing tactic, an offensive move for an industry so often on the defensive in the culture wars, and maybe even a genuine desire to do something when the world is going to pieces. But from Robert Schenkkan’s Building the Wall at New World Stages to the Public Theater’s Trumpified Julius Caesar, it’s hard to escape the feeling that New York theater right now is flailing in the dark with half-baked, knee-jerk bromides. There is certainly plenty of important, timely work being done all over the city by companies large and small. Just a few recent examples: Mfoniso Udofia’s Ufot Cycle plays at New York Theatre Workshop traced the difficulties of assimilation over multiple generations of a Nigerian-American immigrant family, while Martín Zimmerman’s Seven Spots on the Sun at Rattlestick Playwrights Theater directed our gaze south of the border. On Broadway, Lynn Nottage’s Sweat and Paula Vogel’s Indecent mapped the lingering effects of economic and social marginalization, despite being largely dismissed by key critics and overshadowed by the glossier, if hollower, Oslo. 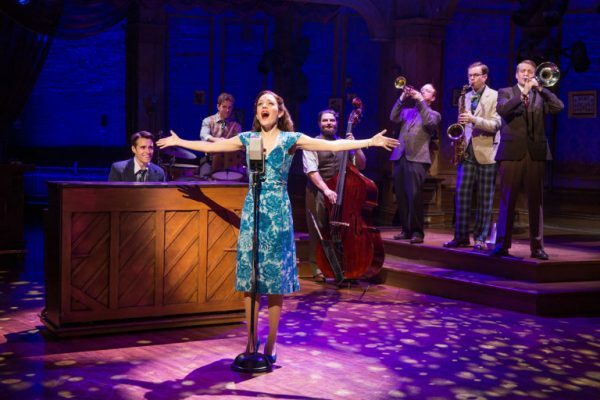 The remarkable musical Bandstand gave it the old college try, but was perhaps a bit too honest and unflinching in its condemnation of American patriotism to survive. Even plays not marketed as “political” subtly rode the zeitgeist: the mixed-race family in Rachel Bonds’ Sundown, Yellow Moon was simply part of the play’s rich tapestry, and Noah Mease’s Omega Kids shouted the trauma of the closet by never mentioning it. Regardless of the framing or subject matter, it’s impossible for theater not to be political, because it shoves people into a room together and forces them to confront one another as messy, three-dimensional, fleshly things. Yet little about our current political moment is business as usual. While no single element of this imbroglio is new (no, not even HIM), circumstances have never coalesced in this particularly disorienting and potentially catastrophic way. Naturally, then, activism has struggled to keep pace, despite (or perhaps because of) the sheer comical ineptitude and banality of the current Administration. It follows that the theater should struggle as well, yet it enjoys a singular advantage: seniority. Theater emerged in Athens roughly contemporaneously with democracy. As British historian David Wiles has shown, politics and theater are just two sides of the same citizenship coin. Yet politics carries on while theater has shuffled to the margins, so how can it make a difference in the age of Netflix and social media? 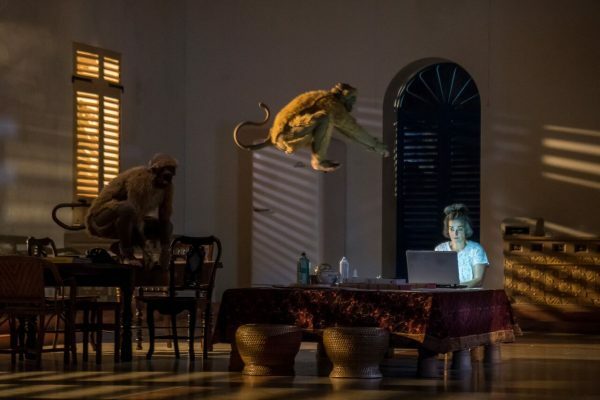 For my money, the most interesting politically-inflected performances last year came from outside the U.S.: Théâtre du Soleil’s A Room in India at the Park Avenue Armory, The Play Company’s Villa (a local production but a Chilean play, directed by its author, Guillermo Calderón), and Belarus Free Theatre’s Burning Doors at La MaMa. All three were conceived well before 2017, but rung out with an acute timeliness because they were candid reckonings with the difficulty of creating political performance, not prescriptive, left-baiting jeremiads. A Room in India, conceived in response to the November 2015 Paris attacks, allowed company co-founder Ariane Mnouchkine to look back on the company’s storied career and interrogate the value of its work, not a particularly original question but a necessary one. Yet it did so in the company’s customarily expansive, multi-cultural fashion, incorporating a host of languages, viewpoints, and theatrical echoes. If it skirted around issues that tend to tie critics and artists up in knots in this era of Representation Above All, it did so in the service of an epic theatrical declaration that filled the immense Wade Thompson Drill Hall, a space that so often swallows a performance whole. At the other end of the spectrum, the relatively tiny stages of Villa and Burning Doors allowed the plays’ specific national concerns to speak to wider issues of censorship, memory, and residual trauma. Greek drama certainly didn’t spare Greek politicians. Aristophanes in particular had a penchant for skewering lawmakers’ excesses and foibles. Yet those resonances are meaningless today; the plays survive because of the quality of the drama. It may seem tautological to say that the best plays are good plays, but far too much of what reaches our stages is flat, tired, and unconvincing. If theater were easy, everybody would be doing it, but there’s really no excuse for the torpid drama of The Portuguese Kid and The Parisian Woman, thinly-disguised reactionary tracts parading tired views on power, gender, and coupling. The Trump interjections would have mattered little if the texts or stagings had had any vibrancy or nuance. Yet these two plays are far from the only examples of the creeping spiritual sickness infecting the boards. The fix, though disparagingly difficult, is no mystery, and is trumpeted loudly and often: greater diversity, funding, and support for artists (and critics) in every aspect of the process, from training onward. Yet I’m not convinced the theater is interested in change. You know that old saying about a broken clock being right twice a day? Well, in a recent interview with The New York Times, Trump said, “newspapers, television, all forms of media will tank if I’m not there because without me, their ratings are going down the tubes.” If he’s not right, the theater is certainly acting like he is, as anyone on a non-profit theater company’s mailing list can tell you. Not only has the specter of Trump been an effective fundraising tool, it’s sold a hell of a lot of tickets. For evidence of this, look no further than the Monday, January 8 print edition of the Times, which featured a full-page ad for the upcoming Broadway revival of Angels in America with Nathan Lane peering grimly over his hands like Al Pacino in The Godfather Part III. “WHERE’S MY ROY COHN?” it quotes Trump in big, All-American sans-serif block letters. “HERE” is the grandiloquently terse, self-aggrandizing response. With returns like these, who would ever want the gravy train to stop? Call me a cynic, but I think we’re destined to continue getting the theater we deserve, not the theater we need.